Dive deep into the museum’s fascinating research and collections with immersive activities, hands-on learning, and interactive games led by ROM experts and designed for kids and parents alike. 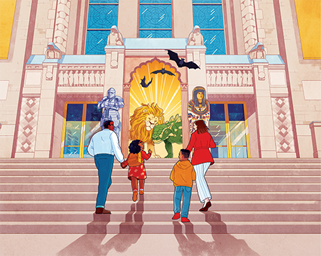 Meet the researchers, scientists and curators that bring the Royal Ontario Museum (ROM) in nearby Toronto to life during March Break from Saturday, March 9 to Sunday, March 17. Dive deep into the museum’s fascinating research and collections with immersive activities, hands-on learning, and interactive games led by ROM experts and designed for kids and parents alike. Drop-in programming is included with general admission. Visitors will also have the chance to experience three specially ticketed exhibitions: Treasures of a Desert Kingdom: The Royal Arts of Jodhpur, India; Zuul: Life of an Armoured Dinosaur; and Wildlife Photographer of the Year. Discover museum secrets hiding within the walls of the ROM, as experts share artifacts and specimens in ROM collections. Learn what it’s like to be part of a research expedition at Field Camp ROM. Explore field techniques, specialized tools and technologies, and camp life with ROM scientists. Enjoy ROM Storytime with ROM researchers sharing their favorite children’s storybooks. Engage in some friendly competition at the ROM GameZone, with games of strategy from around the world. Get up close to the museum’s star ankylosaur at the Zuul Photo Booth. Test your knowledge of Canada’s biodiversity, learn about the joys of camping, and explore Canadian fossil wonders from Burgess Shale with program partner Parks Canada. The ROM will be open from 10 a.m. to 5:30 p.m. March 9-17, with free drop-in programming taking place each day from 10:30 a.m. to 4 p.m. Programming will vary daily with schedules located onsite. Treasures of a Desert Kingdom: The Royal Arts of Jodhpur, India; Zuul: Life of an Armoured Dinosaur; and Wildlife Photographer of the Year are surcharged exhibitions and not included with general admission. For more information, please visit www.rom.on.ca. Be the first to comment on "March Break adventures await at the ROM"